Flickr has stated that it is not trying to compete with general social networks such as Facebook, seeing its service as "complementary". The photo-sharing site, which is currently undergoing a redesign, attracted around 4.1 million unique UK users during January 2012, with approximately 10% of UK internet users using the service in some way. Other social networks, such as Facebook, Google+ and Twitter all offer a way for users to share and upload photos, but Markus Spiering, head of product for Flickr isn't worried by this. "Our goal is that Flickr is the best, richest photo experience, where you can securely store all your photos," he told TechRadar. "At the same time, you can share these to Facebook, Twitter, Tumblr etc - we give people all of those controls. "It's not our goal to replace social networks or have the reach of Facebook, we're more of a centralised place to store your photos." Flickr has recently faced increased competition not only from general social networks, but also from dedicated photo-sharing sites such as 500px. Speaking of perhaps its closest (in terms of similarities) rival, Spiering said, "I can't comment that much on their target audience, but I think it's a subset or our users, I think Flickr is much broader than this site [500px]." For the moment, 500px tends to be used by enthusiast and professional photographers, with users able to customise their profile more extensively than is currently available on Flickr. That is something that is also about to change, according to Flickr. Although he couldn't share any details, Spiering said "we would definitely talk again" about the potential to have customised landing pages for user profiles. 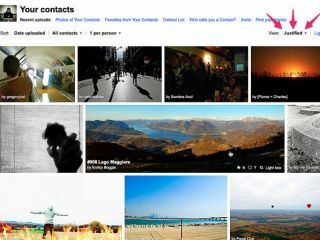 The new Flickr design is currently being rolled out, starting with a new "justified" view, which organises images from a user's contacts in a similar style to the increasingly popular Pinterest, with never-ending scrolling.